Though I am not Jewish I grew up immersed in the culture and, oftentimes, coveting it. Thus, when an opportunity presents itself, I like to celebrate (and, of course, indulge in one particular rite of passage: prepare traditional foods and enthusiastically enjoy them). Hanukkah, the Festival of Light, has many foods associated with it: latkes, sufganiyot, and dairy. Fried foods are symbolic of the limited supply of oil that lasted for eight days, and dairy is symbolic of Judith (Yehudit) who saved her village from destruction. For our Hanukkah dinner, I made potato latkes, noodle kugel, challah, and a pear-walnut cake with honey-orange syrup. I felt assured that all would turn out well, but I had my concerns about the kugel. 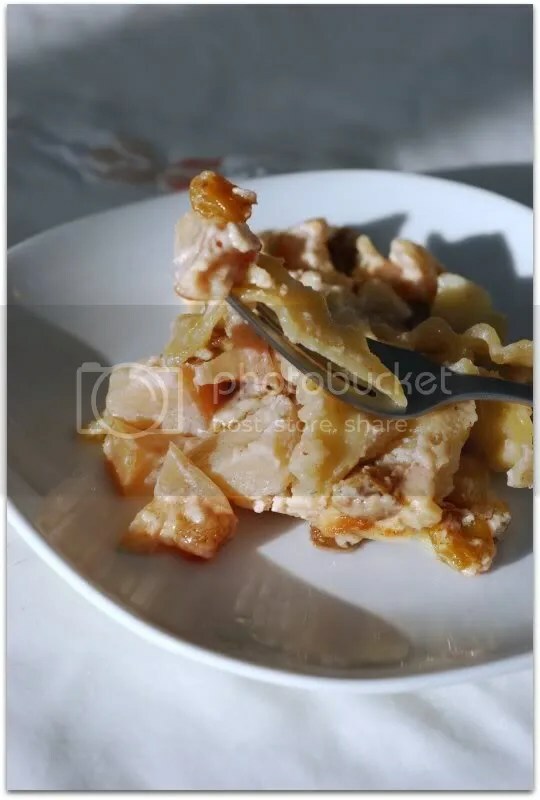 You see, I’ve never actually experienced kugel – I have only heard the tales of woe and horror from my Jewish friends and, as such, steered well clear of any kugel offered to me (a far easier feat once I went vegan). This year, however, I decided to tackle the kugel. According to Wikipedia, “Kugels may be sweet or savory. The most common types are made from egg noodles (called lochshen kugels) or potatoes and often contain eggs, but there are recipes in everyday use in modern Jewish kitchens for a great diversity of kugels made with different vegetables, fruit, batters, cheese, and other flavorings and toppings.” I chose a Martha Stewart noodle kugel recipe that is both sweet and savory. My concerns arose when I looked over the recipe, and the trepidation set in as I began to assemble my ingredients. The combination of flavors appeared to be so unlike any other I have tried – and, more importantly, have enjoyed. This dish was truly jumping into the unknown for me. The other source of concern was how rich the dish must be: the original version called for 2 cups of sour cream, 1 cup of cream cheese, 6 eggs, 1 cup of butter, and 1 cup of sugar – oh my! Not only did I sub in vegan options for the sour cream, cream cheese, butter, and eggs, but I also reduced the quantity of each. Traditional noodle kugel also calls for wide egg noodles, but I used lasagna noodles that I cut into smaller pieces and they worked beautifully. Personal growth can only occur when we take risks and step outside of our comfort zones; the same can be said about the growth of our culinary prowess. This kugel was delicious, and it was, most definitely, the belle of the ball at our Hanukkah dinner. Sure, the challah received its fair share of praise, and the latkes enjoyed their time in the spotlight, but it was the kugel that had people coming back for more. The bonus? It tasted even better the day. 1. Preheat oven to 350 degrees. Oil a 13-by-9-inch baking dish; set aside. Bring a large pot of salted water to a boil. Add noodles; cook until al dente according to package instructions, Drain noodles; set aside to cool. Once cool enough to handle, use a pizza cutter to slice the noodles in half lengthwise and then in thirds widthwise. Put back into pot and set aside. 2. Put oil and sour cream into the bowl of an electric mixer and mix on medium speed until combined. Mix in 1/4 cup sugar, 3/4 cup Earth Balance, and the cream cheese. Set aside. 3. Heat 2 tablespoons Earth Balance in a large skillet over medium heat. Stir in 2 tablespoons sugar, the cinnamon, and nutmeg. Add apples; gently toss to coat. Cook, tossing occasionally, until soft and caramelized, 10 to 12 minutes. Stir apples into sour cream mixture; pour over noodles. Add the raisins and toss gently to combine. Pour into prepared dish. Drizzle remaining 2 tablespoons butter over noodles; sprinkle with remaining sugar. 4. Bake until set and top is golden brown, about 30 minutes. Transfer to a wire rack; let stand 15 minutes before serving. What a great meal! Your substitution ideas all sound perfect, and I bet it was great to eat out of that comfort zone! And my husband just requested a kugel for our Christmas dinner, believe it or not, and this is very timely. .. it also sounds delicious. I, like you, always felt a little envious of my Jewish friends and found myself invited to their holiday tables as often as possible! 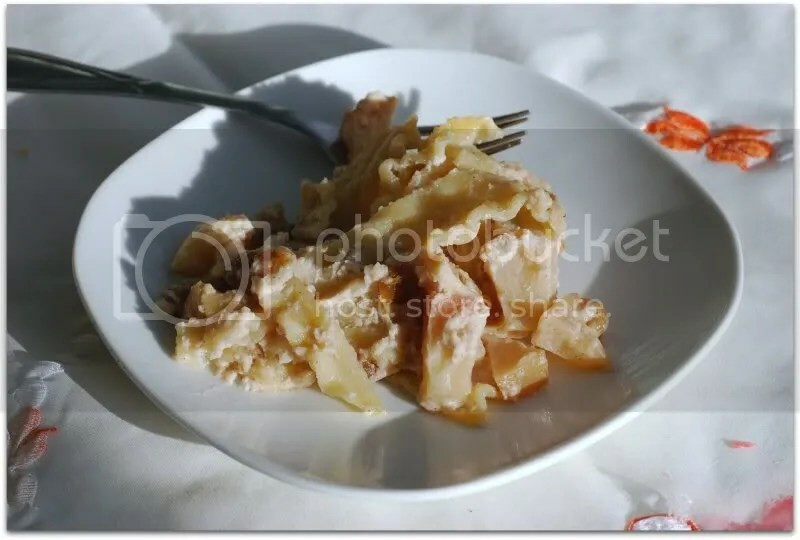 I have made many of the dishes I grew up on, but haven’t managed a kugel – I’m going to have to give this a try! And I love your comment about moving outside of our comfort zones – so true! Congrats on veganizing the kugel… sounds delicious. I am Jewish and in my pre-vegan days, enjoyed a lot of kugel. I never thought you could make it without the metric ton of butter it normally calls for and still have it turn out good. Ricki – A Christmas kugel! I hope that yours turned out deliciously. Shellyfish – Thank you for the comment – we often need to remind ourselves to take those risks! Leo – I made the matzoh-ball soup recipe from Vegan With a Vengeance for Passover this year and it turned out beautifully – I highly recommend it! And to be honest, they kind of intimidate me. But I totally agree with culinary growth. Maybe I should put ‘make Jewish food’ on my New Years Resolutions list?